In 2009, we presented a conversation that we had with Changling Rinpoche on the Tibetan term “nang-si” (the phenomenal world). 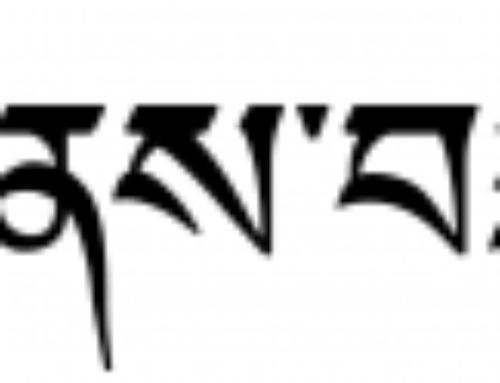 This year in 2010, we offer another excerpt from the same discussion on the first stanza of “The Melody That Accomplishes Deathlessness.” Although there is no debate about how to translate “namdak” (Tib. rnam dag)—it is either “complete purity” or “completely pure”—we had an amusing and educational conversation about its use in context. In addition to Changling Rinpoche (CR), members of the discussion include Larry Mermelstein (LM), Scott Wellenbach (SW), Mark Nowakowski (MN), Patricia Kirigin (PK), Walker Blaine (WB), and Tingdzin Ötro (TO). CR: In the mandala of the deities, the teacher ripens our body, speech, and mind into the three vajras. LM: Is the first line saying that the mandala of deities is the complete purity of the phenomenal world? SW: I think Rinpoche is putting “complete purity” more with the mandala of deities than with the phenemenal world. MN: When we speak of “the phenomenal world,” it sounds like samsara. CR: Yes. In this case, the phenomenal world is just samsara. PK: The phenomenal world means samsara, even though it is the mandala of deities? CR: Yes. It depends on the context. Sometimes “the phenomenal world” goes with both samsara and nirvana, sometimes only with samsara. In this case, the completely pure mandala of deities is talking about samsara. We don’t need to establish nirvana as the mandala of deities. We are establishing samsara as the mandala of deities. WB: I also like the way it reads in our current translation, and I think it is very clear. The mandala of deities is the complete purity of the phenomenal world. This is how I understand the development stage. The stanza says that if the world is completely pure, one’s three gates ripen as vajra nature. LM: But that is different from what Rinpoche is saying. If complete purity goes with the mandala of deities, our translation is not exactly saying what Rinpoche is saying. CR: So now the question is: What is complete purity? Everybody can answer. CR: “The ground of purification” (Tib. chang-shi; byang gzhi) is sugatagarbha, “the thing to be purified” is the phenomenal world, and “the purifier” is complete purity. LM: So purity is what purifies the phenomenal world. CR: So what is the connection between “the thing to be purified”—the phenomenal world—and “the purifier”—complete purity? CR: When you establish the development stage, you have to begin with the purifier, the thing to be purified, and the result of purification. What is the purifier of development stage? It is the view of purity. TO: So, taking the view of purity is what purifies. CR: What is “the ground of purification?” The tathagatagarbha. What is “the thing to be purified?” The phenomenal world. What is “the purifier?” Purity. What is “the result of purification?” The mandala of deities. Obviously, “the ground of purification” and “the result of purification” are related by having the same essence. Tathagatagarbha and the mandala of deities are the same; they are related by having the same essence. All four terms have a connection. What is the relation between “the thing to be purified” and “the purifier?” It is the relation of the basis and what arises from it, like fire and smoke. LM: By purifying the phenomenal world, the mandala of deities then manifests. [in the translation of this line], the purity goes with the mandala of deities. PK: When the phenomenal world is purified, you see the mandala of deities, which has the essence of complete purity? PK: We had a few ideas from yesterday’s meeting. TO: I’d like to say “the phenomenal world, when purified is the mandala of deities.” Is that right? Is that going too far? MN: Whichever you put first—“phenomenal world“ or “mandala of deities”—will come across as the main point. What is the main focus of the sentence? LM: That is what we had originally. CR: Actually we could say “purified” here. LM: What you said yesterday about complete purity really going with “mandala of deities” is what causes us to think what Patricia just said. Whereas the way we had it before, “the complete purity of the phenomenal world” really sounds like complete purity just goes with phenomenal world. As opposed to that it’s doing something to the phenomenal world, purifying it. So we end up agreeing with each other, . . . Whether we say “purity” or “purified”—if I say “purity” I can attack that, and if I say “purified” I can also debate that. Now, looking at all the angles, I think “the complete purity of the phenomenal world” is much better. LM: Yes, I think the way Patricia originally had it is the nicest. When you say “the complete purity of the phenomenal world” to me that’s meaning fundamentally the phenomenal world is completely purity. And that is the mandala of deities. CR: Yes, that’s how we explain it from the point of view of ground. The explanation in terms of “the thing to be purified,” “the purifier,” and “the result of purification” is from the point of view of path. If you phrase it from the point of view of ground, it can be attacked from the path point of view. If you say “purified,” it can be attacked from the ground point of view. LM: There’s no way you’re going to make everybody happy. CR: The tricky thing is that in Tibetan, you can bring in complete purity from any point of view. Complete purity can be primordially pure, temporarily pure—you can just put anything there. SW: So, Rinpoche, you feel that the flavor of this text is more from ground point of view than from the path point of view? CR: Yes. Does “complete purity” show that the real origin of the phenomenal world is purity? CR: I think that if we can show that, we are safe enough. LM: I think that’s what it says. PK: And that would be from the point of view of ground? CR: If we can show the actual origin of the phenomenal world being purity, obviously that is established from the ground point of view. But we can defend quite a lot. LM: We have more ammunition with this. CR: The reason why I’m looking at this is when we look at how Berotsana and other lotsawas (great translators) translated, even in translation there’s no way it can be attacked. So we should also make sure there is purification through the three examinations, even in the translation. PK: So, that’s great. So, we’ll leave it as is then. SW: (laughing) After talking with many lamas, we didn’t change a single word of this line!